During the interaction, Gandhi admitted that Modi-led BJP came to power in India as the people were angry with his Congress party over the issue of unemployment. “Employment is an all-encompassing means to empower, enfranchise and involve Indians in the nation building process. I think, the central reason why Mr Modi arose and to an extent why Mr Trump came, is the question of jobs in India and in the United States. There’s a large part of our populations that simply do not have jobs and cannot see a future. And, so they are feeling pain. And they have supported these type of leaders,” he told students. Gandhi has repeatedly raised the issue of joblessness during his meetings with experts, business leaders and Congressmen in the US. “Currently, we are not producing enough jobs. 30,000 new youngsters are joining the job market every single day and yet the government is only creating 500 jobs a day. And this doesn’t include the massive pool of already unemployed youngsters,” he had said in his earlier address at the University of California in Berkeley. 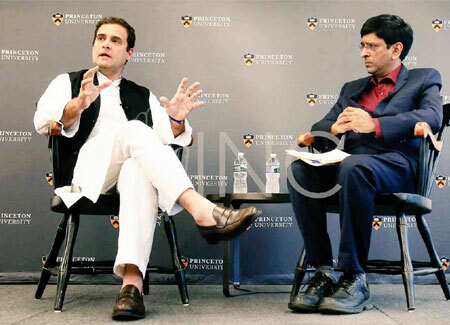 At Princeton, he said India needed to transform itself to compete with China and for that the people in the country required jobs. “Those same people who got angry with us because we couldn’t deliver on those 30,000 jobs (a day) are going to get angry with Mr Modi. The central question is resolving that problem. My main issue with Mr Modi is that he diverts that issue and points the finger somewhere else instead of saying listen we have a problem. There is anger building up in India right now. We can sense it. So to me the challenge is how to solve that job growth problem in a democratic environment. That’s the challenge. So we have to first accept it as a problem. Then we have to unite and try to solve it. Right now, nobody is even accepting it as a problem,” he argued. Pointing out that lack of jobs is leading to migration, Gandhi said, “There are two large migrations taking place — one is completely free and the other is centrally-controlled. The systems respond differently. Indian cities aren’t equipped to handle migration. We aren’t spending enough on healthcare and education. India and China are two huge countries that are transforming from agricultural countries to urban modern model countries. And that’s a huge chunk of the world population. And how these two countries do is going to fundamentally reshape the world. It’s not my place to say that China should be democratic or not. They have chosen their path and we have chosen ours. But there is cooperation and there is competition between the two most populous countries of the world. We have to figure out how to get our jobs. We have to basically compete with China,” he said, adding that frankly India is not doing that well. Coming back to jobs, Gandhi asserted that new technologies and modernisation are unlikely to kill jobs. “The nature of what we call it a blue collar job is going to change. But the question is who is going to have those jobs and which countries are going to have access to those jobs,” he said. Gandhi said there’s a lot of space for cooperation between the US and India in the creation of jobs and in the education sector. “Also historically India has maintained balance. So it has had a relationship with China, with Russia and a relationship with the US. To me the strategic relationship with the US is important. But there is need for a balance (of ties) with all the countries. I would say there is a a slight difference between us and the government,” he said.